The critics of British rule called themselves "Whigs" after 1768, identifying with members of the British Whig party who favored similar colonial policies. In Britain at the time, the word "patriot" had a negative connotation and was used as a negative epithet for "a factious disturber of the government", according to Samuel Johnson. Many Patriots were active before 1775 in groups such as the Sons of Liberty, and the most prominent leaders are referred to today by Americans as the Founding Fathers. They represented a cross-section of the population of the Thirteen Colonies and came from many different backgrounds. 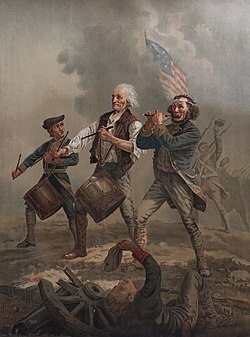 According to Robert Calhoon, between 40 and 45 percent of the white population in the Thirteen Colonies supported the Patriots' cause, between 15 and 20 percent supported the Loyalists, and the remainder were neutral or kept a low profile. The great majority of the Loyalists remained in America, while the minority went to Canada, Britain, Florida, or the West Indies. Historians have explored the motivations that pulled men to one side or the other. Yale historian Leonard Woods Labaree used the published and unpublished writings and letters of leading men on each side, searching for how personality shaped their choice. He finds eight characteristics that differentiated the two groups. Loyalists were older, better established, and more likely to resist innovation than the Patriots. Loyalists felt that the Crown was the legitimate government and resistance to it was morally wrong, while the Patriots felt that morality was on their side because the British government had violated the constitutional rights of Englishmen. Men who were alienated by physical attacks on Royal officials took the Loyalist position, while those who were offended by heavy-handed British rule became Patriots. Merchants in the port cities with long-standing financial attachments to the British Empire were likely to remain loyal to the system, while few Patriots were so deeply enmeshed in the system. Some Loyalists, according to Labaree, were "procrastinators" who believed that independence was bound to come some day, but wanted to "postpone the moment", while the Patriots wanted to "seize the moment". Loyalists were cautious and afraid of anarchy or tyranny that might come from mob rule; Patriots made a systematic effort to take a stand against the British. Finally, Labaree argues that Loyalists were pessimists who lacked the Patriots' confidence that independence lay ahead. The Patriots rejected taxes imposed by legislatures in which the taxpayer was not represented. "No taxation without representation" was their slogan, referring to the lack of representation in the British Parliament. The British countered that there was "virtual representation" in the sense that all members of Parliament represented the interests of all the citizens of the British Empire. Some Patriots declared that they were loyal to the king, but they insisted that they should be free to run their own affairs. In fact, they had been running their own affairs since the period of "salutary neglect" before the French and Indian War. Some radical Patriots tarred and feathered tax collectors and customs officers, making those positions dangerous; according to Benjamin Irvin, the practice was especially prevalent in Boston where many Patriots lived.